I can’t stop staring at these new Maitreya Bare Feet! The bare feet are so realistic and youthful, and so easy to wear. For these Bare Feet, Maitreya has added an additional Match + option on the HUD that can toggle the ankle gradient on/off. I’m wearing the feet with it “on” here, and I really like how it smooths out the ankle seam. I love the nail colors on these toes! If only changing nail colors IRL was this easy! Although there are several Bare Feet in SL, these are my current favorite ones. I like the texture on these Maitreya feet, and also the length and size of the toes. It’s so perfect as it is already, the only thing I can think of that might make it “better” is more nail colors (designs). I shot these photos with Light & Shadows unchecked (no shadows), and used the recommended skin preset for my Pink Fuel (Elly) skin in Honey. It matches perfectly with shadows turned off. If you like photos with Light & Shadows on (like I do), you’ll probably have to tweak the recommended settings a bit. I would love to find nice bare feet and you got me all excited. After looking around quite a bit at Maitreya I finally found the feet. They cost L$675 which is reasonable but I’m not buying till I verify the skin matching Hud really works. Every bare feet skin matching hud I have ever tried is horrible and without skin matching the feet are useless. 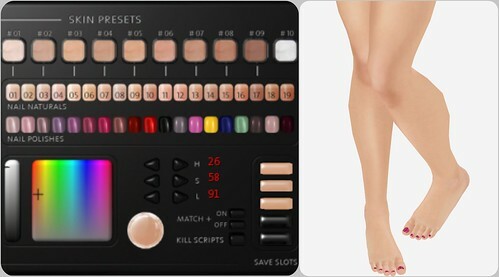 Unfortunately, the Maitreya bare feet demo versions do not include the color matching hud. Darn. So, now I am debating gambling L$675 in hopes of finding the only good color matching hud in SL. I was a bit disappointed. Although the toes are great (really really great) the foot-shape itself is a little bit stiff and cramped (especially on the tip-toes). Also the foot texture around ankle and heel is very ‘flat’, details fading out after zooming further away than 1 meter (maybe too little contrast in the texture). I supposed they just use their usual heel feet-sculpt and texture, but on comparison with the IXkin Heels, there the foot-shape and texture is much much better. So Slink for me still has the most sensual and real-feel feet around in SL. I concur, this comment pretty much sums up everything I want to say. They can’t really touch Slink feet especially in terms of shape. Also, I can’t tell if it’s the angle of some of these pictures but it kind of looks like you’re approaching a cankle situation, especially with the tip toes ones? Oh, I really, really like these! However, I tried the demo, and even the large size looks too small on my av. Resizing them makes the ankles fuzzy, so I guess I’ll have to stick with my Slink feet. For a petite av, they are perfect! I purchased these last night, and I am absolutely in love with them. Since I already had several pairs of the flip flops, these were extremely easy to put on and use the hud. I don’t forsee taking them off for a while! is maitreya having a summer sale? i know they did last year and i’m going INSANE waiting for one so i can still spend the same amt of money (thousands) but get twice the stuff. heh. I wish 🙁 Truth had a sale the same time last year too. I’ve been in SL since 2007 and I can only remember 2 (or 3?) Truth sales. So it is not annual. Probably not annual for Maitreya either. if they have a summer sale, i will be all over their shoes, feet, whatever they offer in the sale but, til then, 675L seems a bit steep especially if the “hud” is NOT included in the demo…. seems odd not to include a “demo” style of the hud if you are leaning hard on your hud being one of the best in sl.. not saying her shoes and hud are not amazing, as i DO own shoes/sandals from her… i just mean, if your going to boost you should show an “example’.. I know alot of ppl that would be in love if this was an option. I am waiting to see if it’s more shiny textures for feet. I have used Pink Fue, but I got tired and switched to a skin with much more shine and highlight down the legs. It’s a much darker skin, and it looks really odd when the foot has no highlights. I remember having this issue with freckled skins too. Lots of freckles down the leg and no one on the foot? I love these. The shape of my Slink feet are amazing but I cannot get a good colour match no matter what I do.. I was able to get a very good match with these quickly and easily by slightly adjusting the presets. Also just want to say that I have found you give the best, most honest reviews of any blogger I’ve seen. I love my maitreya body! But somehow my feet are different colored now from my body 🙁 not sure how to fix this? Just found your blog and LOVE it! ty!